Neo objects fall into three categories: data objects, container objects and grouping objects. These objects directly represent data as arrays of numerical values with associated metadata (units, sampling frequency, etc.). AnalogSignal: A regular sampling of a single- or multi-channel continuous analog signal. IrregularlySampledSignal: A non-regular sampling of a single- or multi-channel continuous analog signal. SpikeTrain: A set of action potentials (spikes) emitted by the same unit in a period of time (with optional waveforms). Event: An array of time points representing one or more events in the data. Epoch: An array of time intervals representing one or more periods of time in the data. Segment: A container for heterogeneous discrete or continous data sharing a common clock (time basis) but not necessarily the same sampling rate, start time or end time. A Segment can be considered as equivalent to a “trial”, “episode”, “run”, “recording”, etc., depending on the experimental context. May contain any of the data objects. Block: The top-level container gathering all of the data, discrete and continuous, for a given recording session. 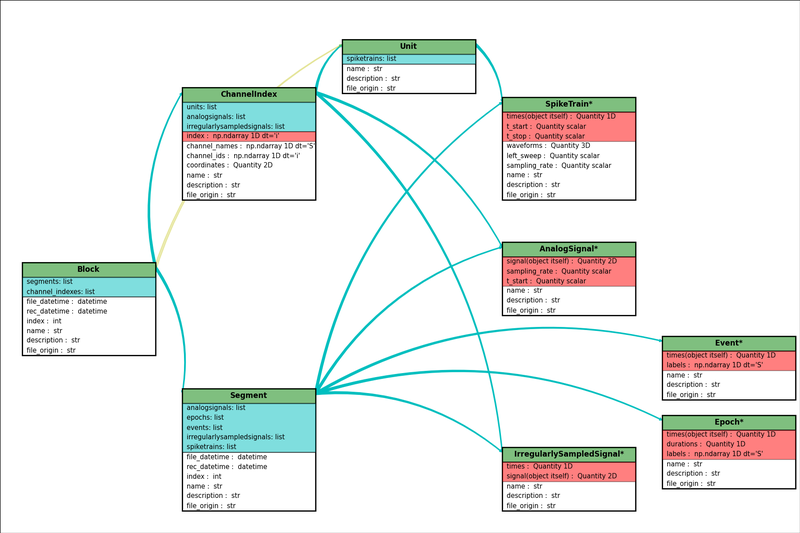 Contains Segment, Unit and ChannelIndex objects. These objects express the relationships between data items, such as which signals were recorded on which electrodes, which spike trains were obtained from which membrane potential signals, etc. They contain references to data objects that cut across the simple container hierarchy. for linking AnalogSignal objects recorded from the same (multi)electrode across several Segments. 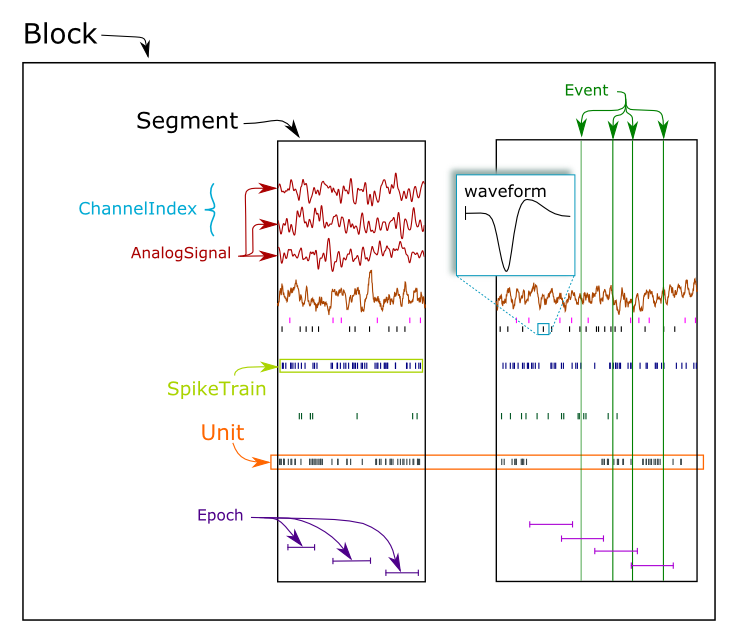 for spike sorting of extracellular signals, where spikes may be recorded on more than one recording channel, and the ChannelIndex can be used to associate each Unit with the group of recording channels from which it was obtained. Unit: links the SpikeTrain objects within a Block, possibly across multiple Segments, that were emitted by the same cell. A Unit is linked to the ChannelIndex object from which the spikes were detected. Neo data objects inherit from Quantity, which in turn inherits from NumPy ndarray. This means that a Neo AnalogSignal is also a Quantity and an array, giving you access to all of the methods available for those objects. For example, you can pass a SpikeTrain directly to the numpy.histogram() function, or an AnalogSignal directly to the numpy.std() function. In the Neo diagram below, these one to many relationships are represented by cyan arrows. In general, an object can access its children with an attribute childname+s in lower case, e.g. Note that because neurons are sorted from groups of channels in this situation, it is natural that the ChannelIndex contains a reference to the Unit object. That unit then contains references to its spiketrains. Also note that recording channels can be identified by names/labels as well as, or instead of, integer indices. See Typical use cases for more examples of how the different objects may be used. For more details, see the API Reference. Neo objects are initialized with “required”, “recommended”, and “additional” arguments. Required arguments MUST be provided at the time of initialization. They are used in the construction of the object. Recommended arguments may be provided at the time of initialization. They are accessible as Python attributes. They can also be set or modified after initialization. Additional arguments are defined by the user and are not part of the Neo object model. A primary goal of the Neo project is extensibility. These additional arguments are entries in an attribute of the object: a Python dict called annotations. Note : Neo annotations are not the same as the __annotations__ attribute introduced in Python 3.6. SpikeTrain is a Quantity, which is a NumPy array containing values with physical dimensions. The spike times are a required attribute, because the dimensionality of the spike times determines the way in which the Quantity is constructed. The spike times could also be in a NumPy array. Recommended attributes must be specified as keyword arguments, not positional arguments. Because rat_name is not part of the Neo object model, it is placed in the dict annotations. This dict can be modified as necessary by your code. Since annotations may be written to a file or database, there are some limitations on the data types of annotations: they must be “simple” types or containers (lists, dicts, tuples, NumPy arrays) of simple types, where the simple types are integer, float, complex, Quantity, string, date, time and datetime.